A Shi’a man mourns the loss of family after a religiously motivated attack on a Pakistani marketplace leaves over 80 dead. On April 13, 2013, members of the Islamic extremist group Al Shabaab shot 42-year-old Fartun Omar to death in Buulodbarbe, Somalia, less than a year after Omar’s husband was killed for converting to Christianity. On April 8, 2013 a Russian prosecutor indicted sixteen Jehovah’s Witnesses. Their crime: attempting to reorganize the local community of their religion after a court-ordered ban four years ago prompted the dissolution of Jehovah’s Witnesses. 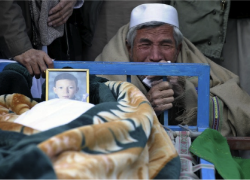 On February 19, 2013, more than 80 people died after a bomb exploded in a market in Quetta, Pakistan frequented by Shi’a Muslims who are often targeted by Sunni extremists. On three continents, members of three different faiths were targets of violence and discrimination because of their beliefs. Tragically, while each story is unique, they are not unfamiliar. According to a new study by The Pew Forum on Religion and Public Life, approximately 75 percent of the world’s population live in countries with high government restrictions on religion or high social hostilities involving religion or both. Government restrictions include laws, policies, and actions that restrict religion while social hostilities measures religious hostility by private individuals and groups. Despite the overwhelming occurrence of religiously motivated violence and state sponsored suppression, religion accounted for only .7 percent of all U.S. mainstream media coverage. Even more troubling, only a small fracture of that percentage focused on international issues, such as international religious freedom. In an attempt to reconcile the disparity between the number of individuals who suffer because of their religion and the dearth of media coverage regarding religious persecution, the Hudson Institute’s Center for Religious Freedom has created the Persecution Report, a daily aggregator of news stories pertaining to violations of religious freedom. Religious suffering occurs in the shadows of the American public consciousness, but literally penetrates into the depths of victims’ souls. The Persecution Report seeks to be a light unto the dark world of religious persecution, not only to inform people of its occurrence, but to give hope to the persecuted that they will not suffer in silence. Bryan Neihart worked with the Hudson Institute and is currently a second year law student at the University of Denver Sturm College of Law, a master’s candidate at the Korbel School of International Studies, and is DJILP’s incoming Survey Editor.